I've decided to retire this blog. I just feel like it's the right thing to do now that Mom is gone. I will have a few more posts though before I officially sign off so stay tuned. She is, indeed, greatly missed. I've mentioned to a few people that I feel a bit like a lion who has lived in captivity for a long time. The door to the cage may be open but I forget that I can walk through. I still seem to think I have to be home at 5 pm to relieve caregivers, I still wait for the phone to ring to coordinate schedules. In fact, when John and I were out of town recently for 3 nights, my phone didn't ring once. The silence was deafening. John and I were recently talking about taking a 9 day cruise. My immediate reaction was "I can't leave for that long" and, the minute the words entered my mind, I remembered that I now can. It was a bittersweet moment. I have, though, been getting on with life. I cleaned Mom's closet - good quality nightgowns and robes are going to a senior citizen home in Brazil where they have next to nothing, new items (tags attached) are going to some of my friend's Moms, and a few items will remain here with me. I have to do the room in pieces though as it can be a bit overwhelming to do it all at once. Her presence is still felt everywhere as I hope it will remain for a long while. I am also in deep awe of the support my friends, both near and far, have given me. For an example, just this morning, I've been sitting and reading the volumes of comments on one of my last articles Death and Dying - dealing with the restless patient. Just read some of the comments (hit the "more comments" button at the bottom to load another page). I know my Mom would be proud of these types of writings and I always read the comments to her, even as she lay dying. As I mentioned, I will be adding more names in future postings prior to retiring Gertie's Galavants. As to my physical friends, they're the most wonderful group of people I could ever have chosen. Friends are, after all, the family we get to choose, and I just couldn't have done any better. The day Mom died, I came home to find the hospital bed out of the living room (it had already been picked up), my dear friends had already rearranged the living room into a very nice seating area and everything was sparkling clean due to Carina, Joni, Bobbi and Sharyn's attention and true love. Sharyn et al handled all of the vendors picking up oxygen equipment, the other hospital bed, commode, etc. I didn't have to deal with any of that stuff. What a burden off my back. I hope that all of my friends realize that I will repay the honor of their friendship any time they need me. As I'm the last year of the baby boomers, my friend's parents are aging and some of my friends will be faced with the caregiving role. I hope to be able to pitch in and help them learn how to deal with this challenging role with good humor and grace and give their patients dignity in their last years. That will, hopefully, be a legacy I pass on. My momma taught me well. She guided me every single step of the way. I could not have hoped to care for a more compassionate, gentle souled lady. Up to the very end, she wanted to lessen my burden and would do anything I asked her to do - sometimes even painful things as help me turn her to her side. She never shed a tear and only spent quiet moments staring deep into my eyes. I felt her love and still do. I have more pictures that I haven't even seen yet - haven't downloaded them from my digital camera but I know I have some beautiful pics of my Mom during the times she rallied. So, stay tuned. There will be more to come before my final chapter is through. Lori much love back to you. You are in my thoughts and prayers! Now I will send that big hug. BIGGGGG Hug! You and your mom have taught me so much about life and love. 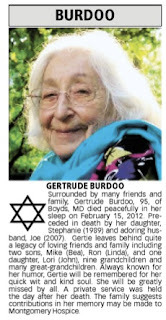 You are truly an amazing person and so was your Gertie. I want to be her when I get old. She was a unique character. You did well. Now it is time for you to live to the fullest and enjoy because you deserve it! Oh, I can just imagine how your life has changed. You expressed it very well. Take care, Lori. Enjoy sorting through Gert's things. I still enjoy it when I stumble upon one of my mom's items I've tucked in a drawer. I wear a couple of her nightgowns, and it all feels good.